During his inauguration, Governor Wolf said he does not want to be part of the first generation of Pennsylvanians who have to tell their children they have to go elsewhere to achieve success. He said that in order to build a better Pennsylvania, his administration will be dedicated to three simple things: jobs that pay, schools that teach and government that works. Pennsylvania can achieve these three goals, but we need to act now. During his first 100 days in office, Governor Wolf has taken concrete actions and introduced bold proposals to secure a better future for Pennsylvanians. Governor Wolf’s Budget – a Blueprint for Pennsylvania Governor Wolf’s budget fixes the deficit, makes historic investments in education, rebuilds the middle class by strengthening manufacturing and workforce development, and provides property tax relief to middle-class families and seniors. Governor Wolf proposed a severance tax on natural gas so we can fund our schools for a change. In only two weeks, Governor Wolf’s GO TIME initiative identified $109 million in savings. Immediately after his swearing in, Governor Wolf hit the ground running. He signed two executive orders; one banning gifts for all employees of the executive branch and another reforming the way the commonwealth chooses outside legal firms. Governor Wolf didn’t stop there. He also decided to proactively release his public events each night and his calendar every Friday. Governor Wolf has visited schools and businesses to talk about his plans to rebuild the middle class in Pennsylvania. He’s made 20 trips to talk with teachers and students about how to fix Pennsylvania’s schools and 15 visits to small businesses and workforce development centers. Governor Wolf has also introduced new ways to communicate with the public – he held the first ever governor’s Twitter and Facebook town halls where he responded directly to people asking him questions. The governor has also made efforts to reach out to members of the legislature by dropping into their offices and inviting them to policy discussions at the residence. Governor Wolf signed an executive order reinstating a moratorium on new leases for oil and gas development in state parks and forests. Governor Wolf acted swiftly to expand Medicaid and simplify a complicated process and ensure hundreds of thousands of Pennsylvanians have greater access to the health insurance they need. As a result of Governor Wolf’s continued efforts, Pennsylvania families get to keep their CHIP coverage. Governor Wolf eliminated the SNAP asset test, a decision that will save millions in state funds and better protects Pennsylvania’s most vulnerable. Governor Wolf’s administration initiated a cross-agency collaboration to equip the State Police with the live-saving drug, Naloxone. Pennsylvania can have a bright future, but we cannot simply do the same things over and over and hope for different results. 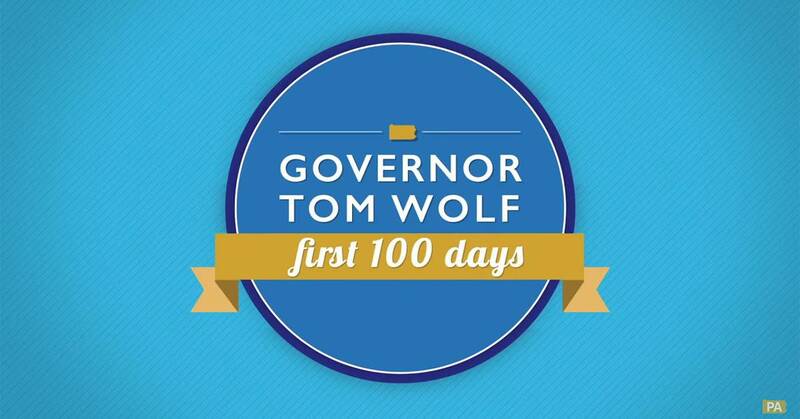 Over the next 100 days and beyond, Governor Wolf will continue to work to rebuild the middle class by pushing three priorities: jobs that pay, schools that teach, and government that works.